Hello and welcome back to another update of Forgotten Hope 2. 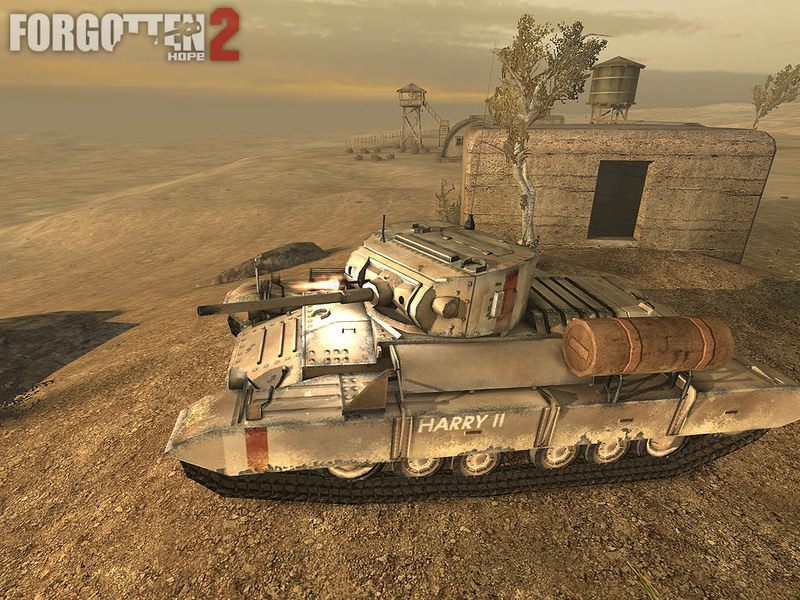 Today we want to reassure you that , with every week passing by, more and more of the machines of war which saw action in North Africa, get into the game. One of these items is to be shown today. 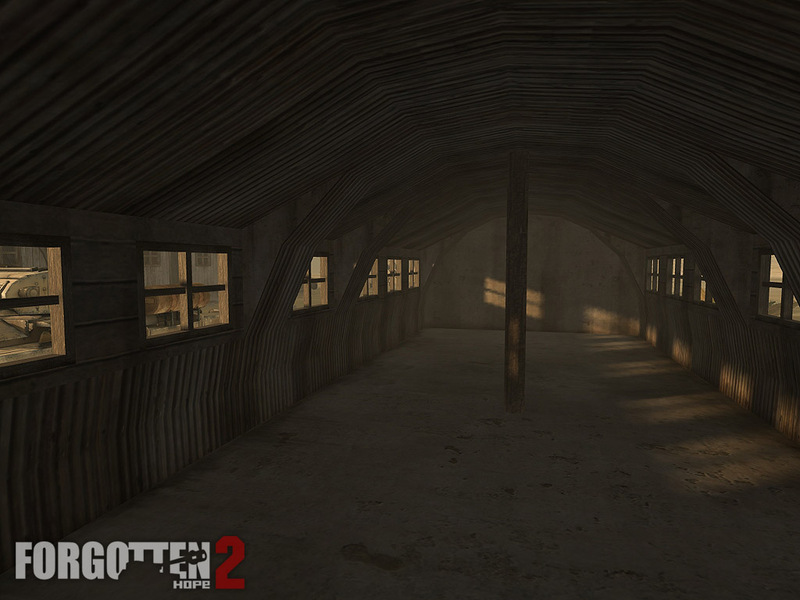 Last December we showed a render of the M3 Grant, but today, we are able to present our first in-game screens of the Grant. Although U.S. practice was to refer to tanks by undramatic numerical designations (like M3 Medium) British troops tended to give lend lease equipment more memorable titles, especially the names of generals from the American Civil War. The original M3 was designated for Confederate General Robert E Lee, however the modified version preferred by British Forces was called the Grant, after Union General, and later President, Ulysses S Grant, known popularly as "Unconditional Surrender" Grant for his refusal to offer terms. 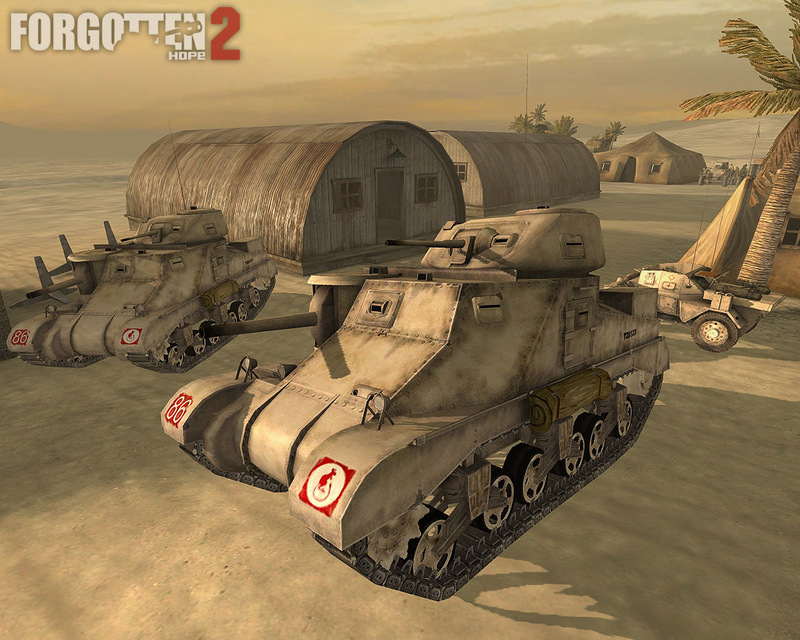 The Grant saw action first in 1942 at the battle of Gazala and when it entered the battlefield for the first time, the M3 was generally appreciated for its mechanical reliability, good armor, and heavy firepower. It outclassed any available British tank and was a serious threat for any German armoured vehicle. Now -- 64 years later -- the Grant enters service another time. The Grant was modeled by Lude and tweaked, normal-mapped and skinned by Omni. Hello and welcome back to another update of Forgotten Hope 2. 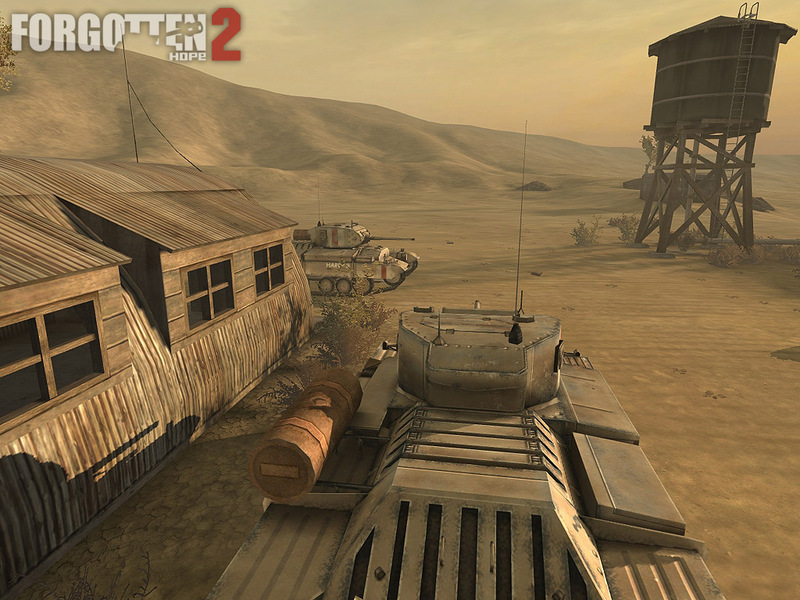 It is time to show off some progress again - machines of war, which will be at your service later on. Today's reinforcements represented the serious threat to Allied supply freighters. But relax those itchy mouse-trigger fingers! A few more words of introduction are in order. The Second World War had many different aspects, one of which was the struggle to control the flow of resources. Supplies and reinforcements were essential to gain a dominating position in all theaters, but especially so in the barren landscape of North Africa. Both sides used submarines to locate and sink enemy war potential before it could be used against friendly troops. The German Navy, or Kriegsmarine, was especially reliant on subs, as the rebuilding of the surface navy had only just begun before the outbreak of war. There was little hope of defeating the greatly superior Royal Navy in a surface battle, and submarines were relatively cheap, quick to produce and hard to detect. These advantages, combined with advanced communications, encrypted using the famous Enigma cypher machine, made the German Uboat a major threat to the Allied war effort. 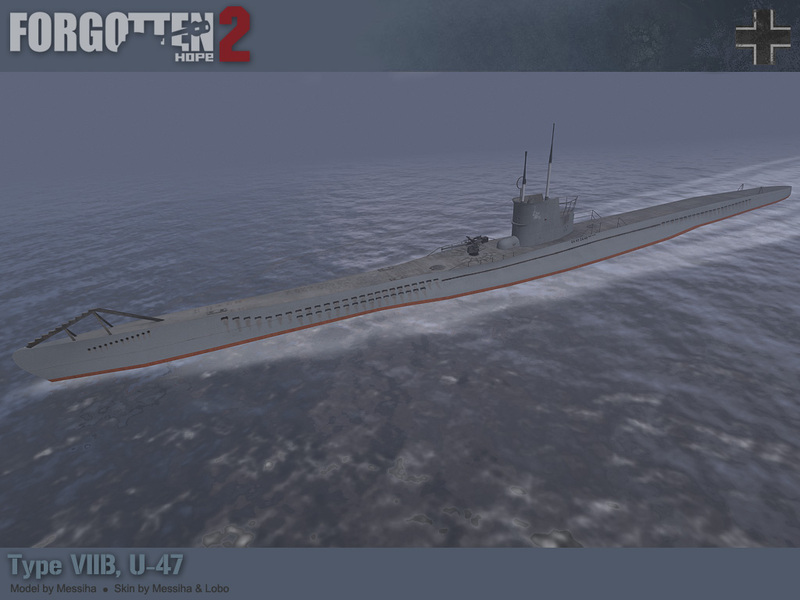 One type of boat used by the Kriegsmarine was the submarine Type VII B, a further development of the Type VII A. Between 1936 and 1940, 24 boats were constructed. With an overall length of 66.5 meters , and a weight of 1040 tons, the Type VII B was powered by two 1400 PS diesel engines, allowing it to reach a maximum speed of 17.9 knots (33 km/h) on the surface. Submerged its electric motor limited it to around 8 knots (15 km/h). The Type VII B was armed with 14 torpedoes (with 4 tubes in the bow and 1 in the stern) and an 88 mm/L45 SK C/35 deck gun with 220 rounds of ammunition. German submarines sunk a total of 2882 merchant ships and 175 warships. Very successful in the early years of war, the uboat wolf packs found themselves becoming the prey rather than the hunters following the deployment of sound navigation and ranging equipment (sonar). At the end of the war 784 of the 863 uboats in service had been sunk. 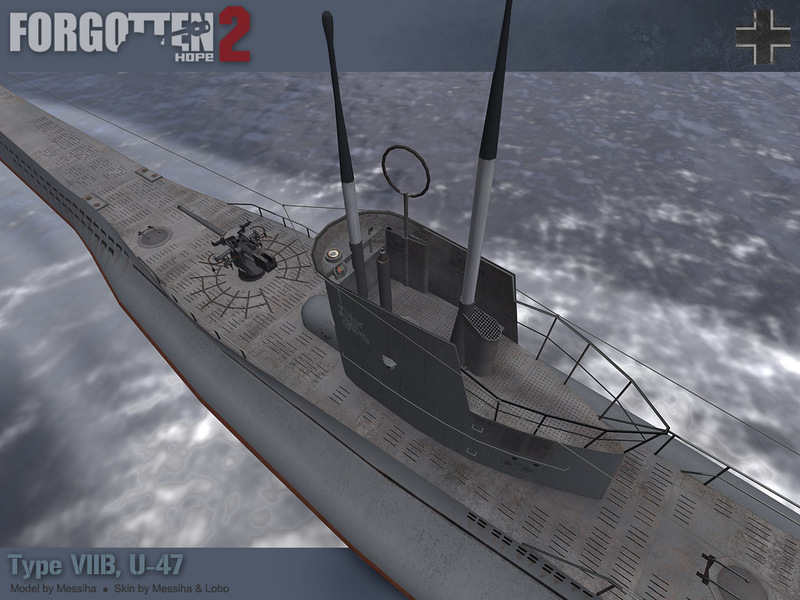 More than 30,000 of the 40,000 "U-Boot M�nner" died by the end of the war. 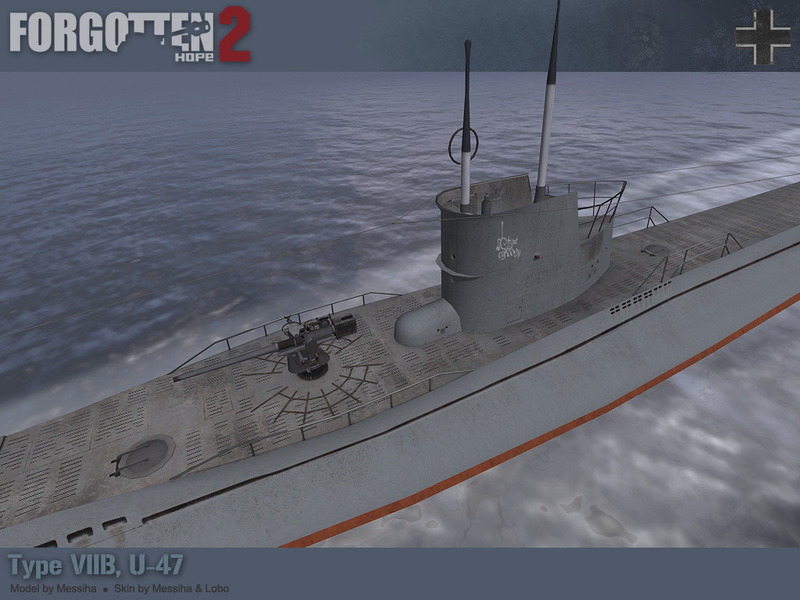 One of the most famous Type VII B uboats was the U-47. It was notorious for its October 14, 1939 attack, under the command of G�nther Prien. U-47 entered the base of the British home fleet at Scapa Flow, and sank the battleship HMS Royal Oak. But enough words. Have a look and enjoy this beauty, modeled by Messiha. and skinned by Messiha. and Lobo. Greetings and welcome back to this week's news update for Forgotten Hope. 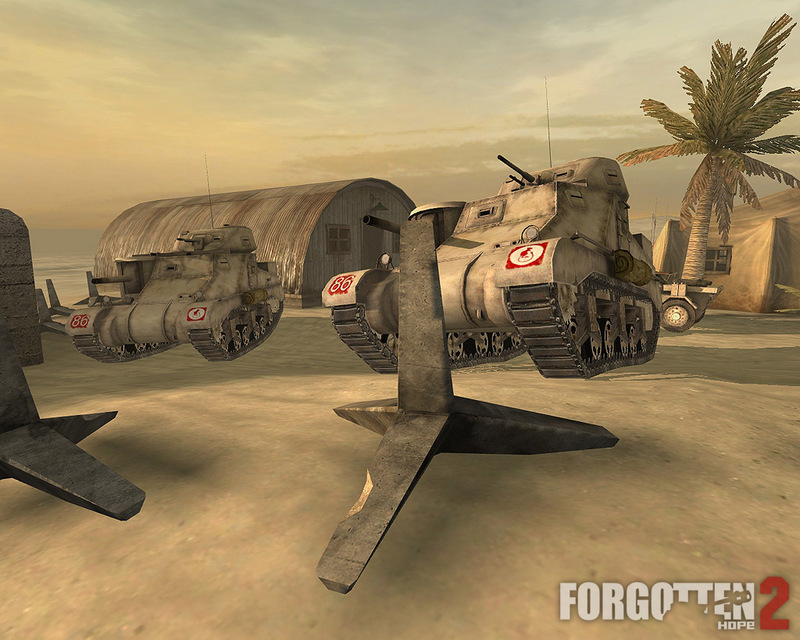 Before we get to new stuff for Forgotten Hope 2, we want to remind you all that Forgotten Hope for BF1942 is still alive and kicking. We will be posting fresh news about the Fan Map Pack soon, and it looks as though this one will be the best one ever, with many very strong entries. As if that wasn't enough, Battle for Europe: World at War is nearing the start of its 12th Campaign of fierce, tactical, and organized FH team play, on an large scale. 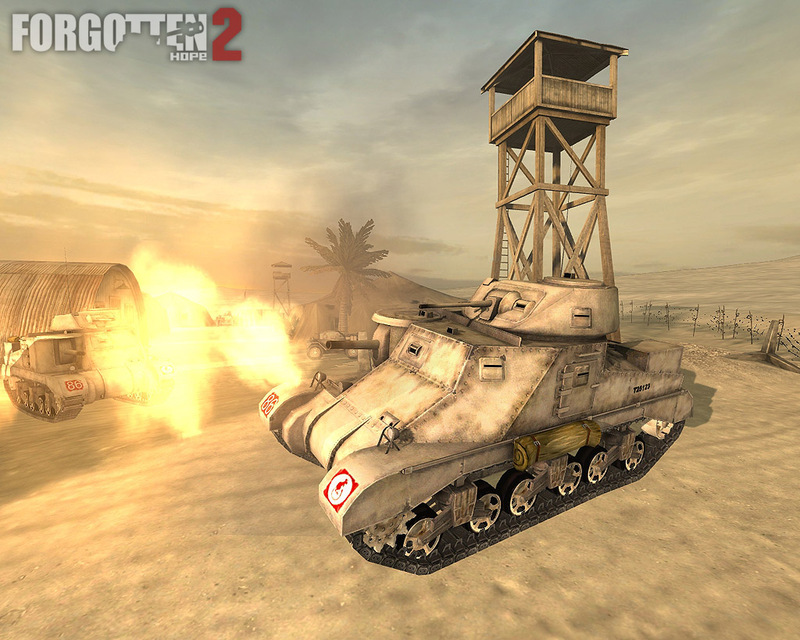 BFE:WaW has exciting, large scale, twelve hour battles every week that allows you to fight under a disciplined chain of command, working together as one cohesive force. Remember, BFE is not a clan, it's an organized tournament. In BFE-WAW you can enlist in one of 8 companies, from 2 divisions, across Armies representing both the Axis and the Allies during World War 2. Each division has a skilled, structured, and organized chain of command. Join up as a lowly line grunt, and then work your way up through the ranks. The only question left is: What side are you on? Campaign XII will feature many new concepts including a historical timeline--each week of the campaign will be assigned a date that is used to determine what equipment is available for the battles that week. The officers of each side will now be responsible for purchasing their force's equipment before each week's battles! And better yet, the other side will not know what they are facing until the action starts! Happy Valentines's Day from the FH Team! Next week many of you will no doubt be distracted by Valentine's Day goings on--flowers and chocolates for girlfriends and wives (hopefully not both) and so on. Today, though, it is Valentine's day for you, because this week's FH2 news features the first in-game shots of the FH2 Valentine Mark II infantry tank. The Valentine was the most-produced British tank of the war, and perhaps the most successful of the early war British designs, mainly due to its reliability. 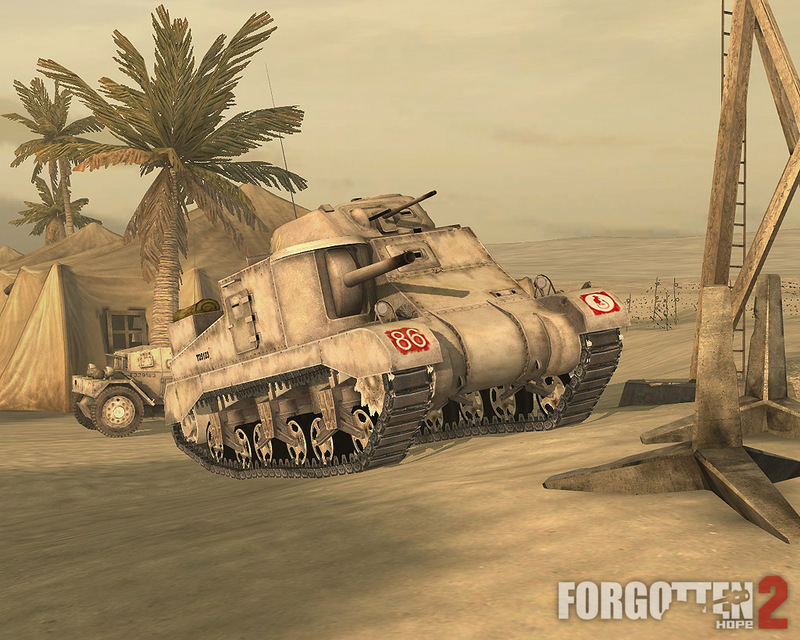 It saw action for the first time in 1941, during Operation Crusader, and served throughout the desert campaign. Although Valentines were not used much in Western Europe, they also saw action in the Pacific and in Soviet service on the East Front. The Forgotten Hope 2 Valentine was modeled and skinned by Montoya and imported and coded by ctz. 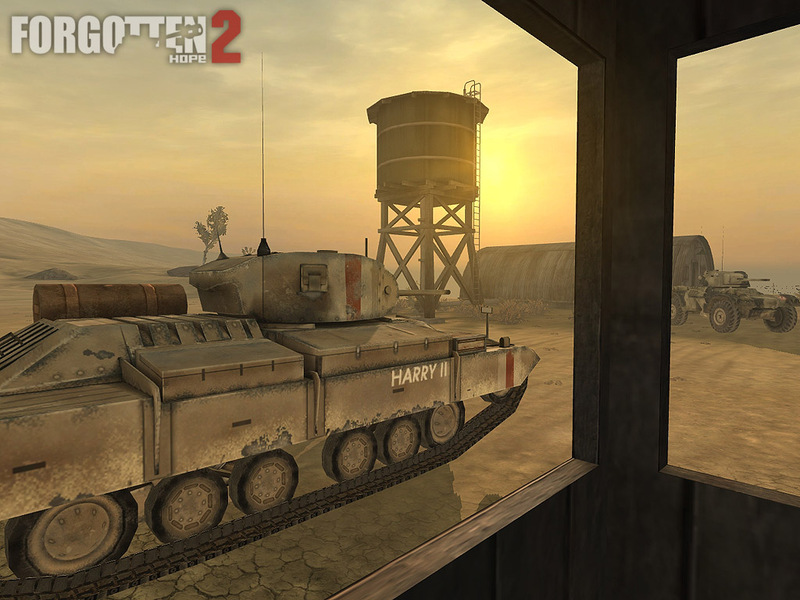 Also, although we can't let you hear them yet, the Valentine has all new sounds created by Citizen Soldier. 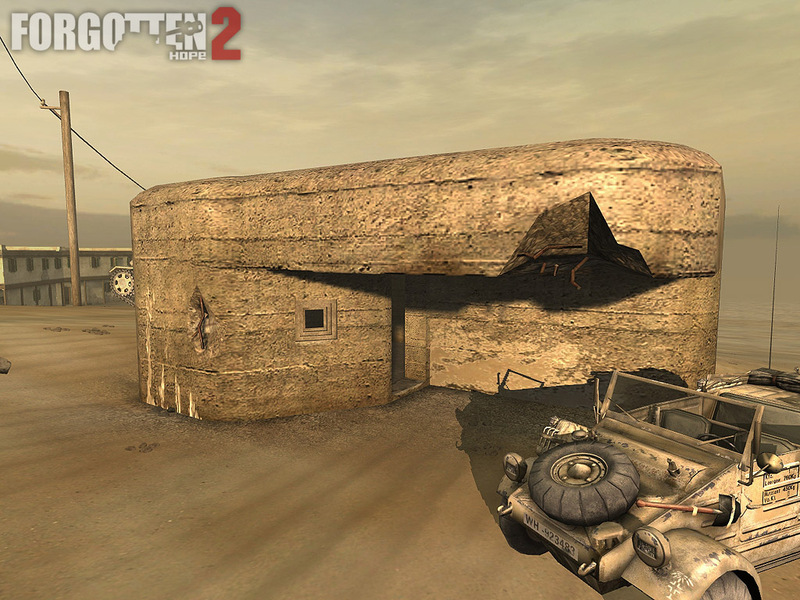 Also notice the Nissen hut, originally modelled by The Jackalx2k for FH and imported and retextured for FH2 by ctz. Greetings and welcome back to another news update for Forgotten Hope. Just a small one this week, but first we have some more news of further laurels for Forgotten Hope and Forgotten Hope 2, this time from ModDB.com. They have completed their end-of-the-year awards calculations, and awarded us two distinctions. 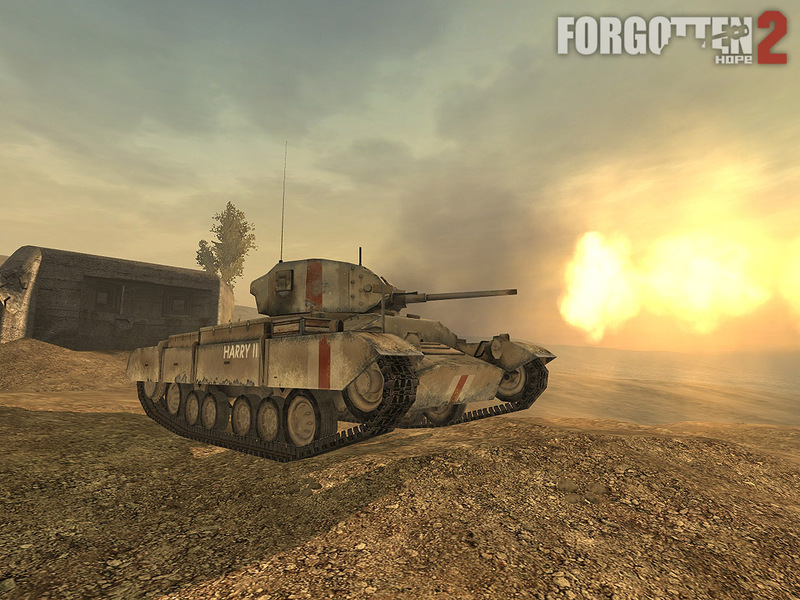 First, Forgotten Hope 0.7 for Battlefield 1942 placed a respectable fourteenth out of all the mods considered for Mod of the Year for 2005. 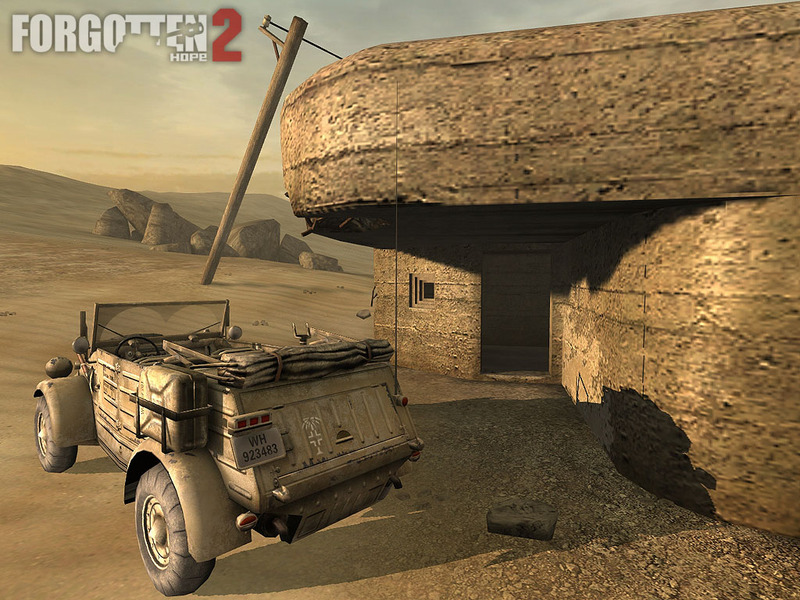 Even better, Forgotten Hope 2 for BF2 came in second in the competition for the Top Unreleased Mod for 2005! Of course, Number One is more fun, but considering the tough competition, we feel pretty good about this news. Congratulations as well to the actual winners, and to all the other mods who got listed! OK, enough with the self-congratulation. This week we are featuring some work that is mainly by Lobo, our Fearless Leader. Ever since Lobo foolishly accepted the thankless job of guiding the mod, much of his time has been taken up endless little details of coordinating the work of the other devs, communicating with potential recruits, helping other members of the team solve problems and so on. 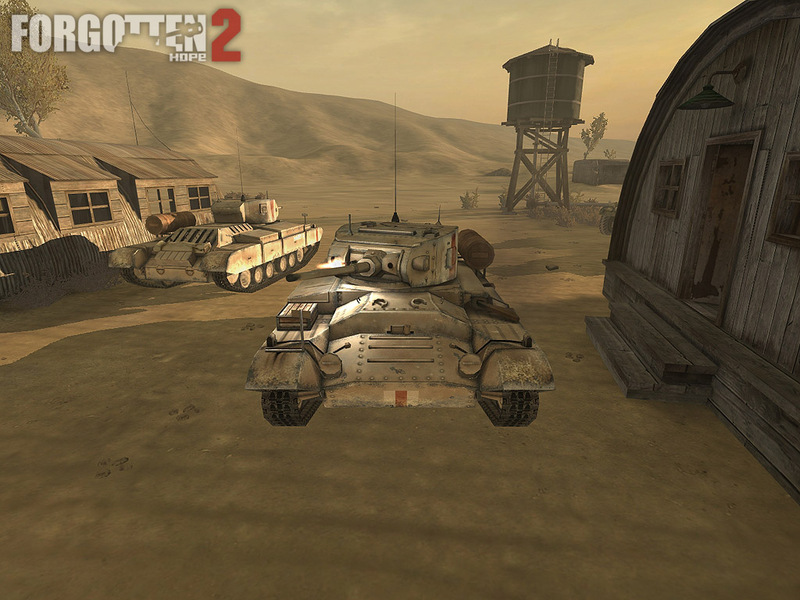 Fortunately, he still manages to find time to get actual modding done, and here are some of the results. First up is the Fairey Swordfish Mk. I. The Swordfish was a torpedo bomber, used by the Royal Navy during World War II. Entering service in 1936, its served throughout the war, despite its old-fashioned biplane design. The Swordfish, or "Stringbag" as it came to be known by its crews, was slow and vulnerable to enemy fighters and flak. 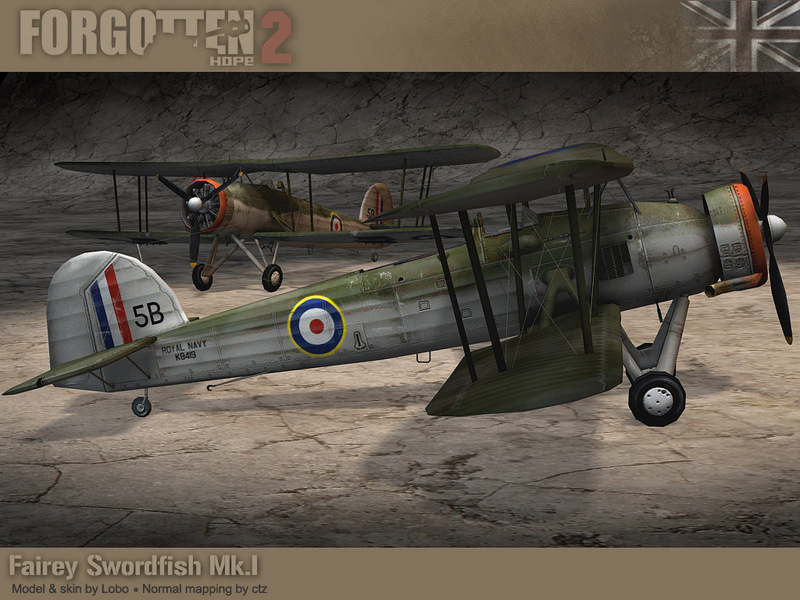 Even so, Swordfish scored many remarkable successes, taking part in the successful strike against the Italian fleet at Taranto, in 1940, participating in the sinking of the Bismarck in 1941, and playing an important role in the Battle for the Atlantic, as well as the struggle to control the Mediterranean supply lanes to North Africa. 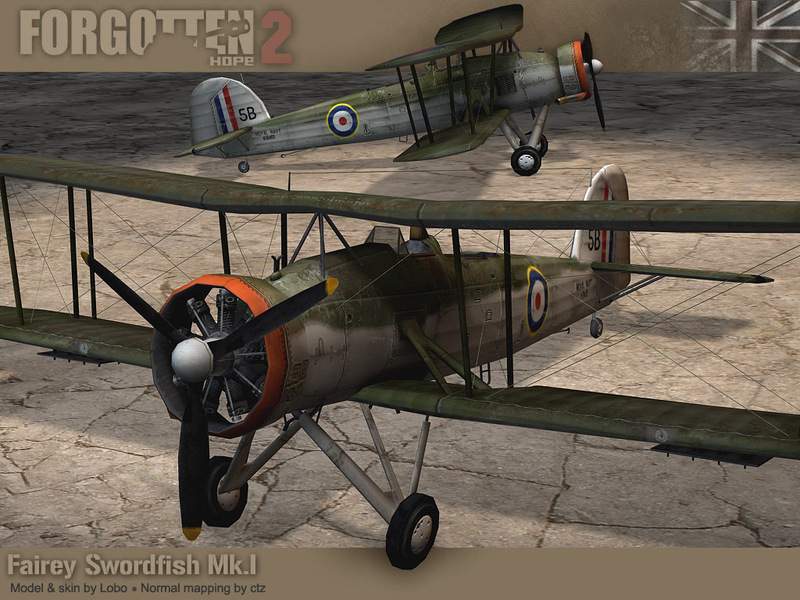 The FH2 Fairey swordfish is based partly on the original FH swordfish, which was modeled and skinned by Lobo. He remodeled and reskinned it to bring it up to FH2 standards of detail and quality, and ctz contributed an all-new normal map. Next up is a defensive bunker, of German design. 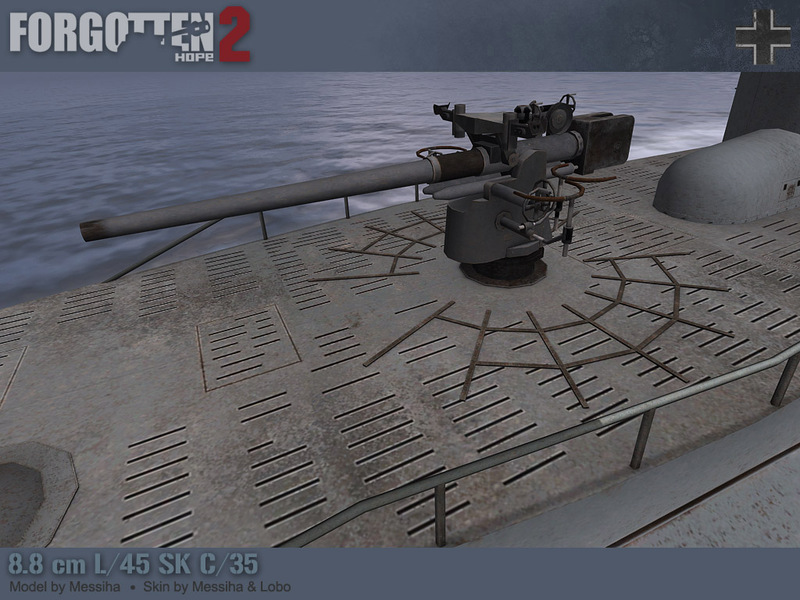 The original model was by Lobo and is also of FH for BF1942 vintage. He remodeled it for FH2, and created an entirely new skin, based on textures provided by Rad.